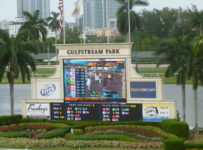 Monday, March 30 — Gulfstream Park set a record for Florida Derby day handle on Saturday as bettors at the track and off-site combined to wager $27,255,851 on the 14-race card. 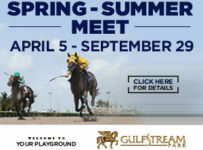 With that huge day and almost $10 million in all-sources handle on Sunday, Gulfstream is on track for what could be a record season at its 2014-2015 championship meet (winter meet) that will end April 5. To do that, Gulfstream would have to top the $8.55 million per day it averaged in 2012-2013. The previous Florida Derby day all-sources handle record of $26,820,951 was set March 29, 2014. Gulfstream had 14 races on Florida Derby day last year and this year, each time with the $1 million Florida Derby (Grade 1) for 3-year-olds as the final race. Also on Saturday, Gulfstream had live on-track handle of $3.302 million to set a record for the building it opened in 2006. The previous on-track record of $3.196 million was set on March 30, 2013, that year’s Florida Derby day. All-sources handle that day was $20,297,263. 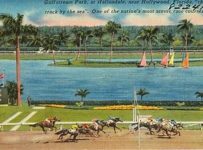 Gulfstream officials said Saturday’s all-sources handle (total bets on races at Gulfstream) was the highest in the track’s history except for the Saturdays in 1989, 1992 and 1999 when it held the Breeders’ Cup. 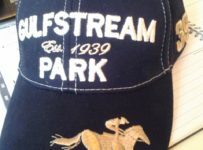 The Gulfstream record was set on Nov. 6, 1999, the day of the Breeders’ Cup. According to the Breeders’ Cup record book, all-sources handle was $96,485,255 for that day’s eight Breeders’ Cup races at Gulfstream. Attendance was 45,214. All-sources handle consists of bets made on track, at other tracks and OTBs that have simulcasting, at sports books in Las Vegas and other locations, through ADWs and via legal phone betting services. On Sunday, Gulfstream had all-sources handle of $9,329,570 for 12 races. For the five days between last Wednesday and Sunday, Gulfstream had average daily all-sources handle of $10.8 million. Gulfstream will be dark Monday and Tuesday. The final five days of its championship meet will be this Wednesday through Sunday. 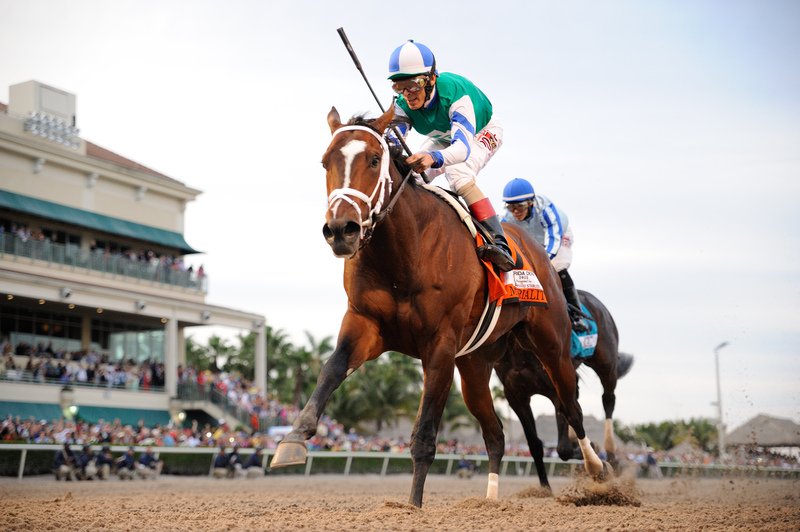 The Gulfstream record for daily average all-sources handle is $8.55 million, set at its 2012-2013 championship meet. 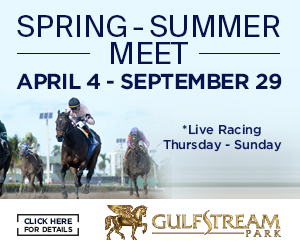 Gulfstream has not released any meet-to-date handle numbers. But our review of Equibase Co. charts indicates there is a strong chance it will break the record it set two years ago. 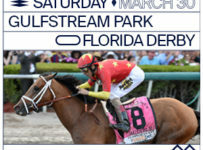 Gulfstream scheduled the Florida Derby as the 14th and final race partly to induce fans to stay until the end and keep pouring money into individual races and multi-race bets. 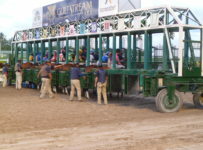 The plan worked, as bets that included the Florida Derby totaled almost $6 million–$5,921,085 to be exact. The Win/Place/Show betting on the Florida Derby was $1,585,621. Exacta, trifecta and superfecta wagering was a combined $2,132,587. 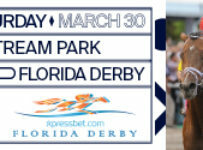 The total of the WPS and single-race exotic bets was $3,718,288 for the Florida Derby. Multi-race wagering figures for the day’s final races were: $261,729 for the Double; $274,470 for the Pick 3; $815,491 for the 50-cent minimum Pick 4, $481,556 for the 50-cent minimum Pick 5 and $363,551 for the 20-cent only Pick 6. 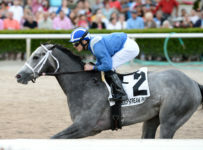 Fans who stayed until the end saw a Florida Derby stretch duel in which the unbeaten Materiality beat favored Upstart by one and one-half lengths. This week, we’ll review the Florida Derby and Gulfstream’s 3-year-old stakes season and look at the prospects for “Gulfstream horses” in the May 2 Kentucky Derby. In 2014 and this year, Florida Derby day was rain-free with seven graded stakes. Gulfstream averaged 9.2 starters per race each day. 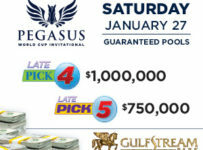 Gulfstream has free admission to its racing area and it does not estimate attendance. 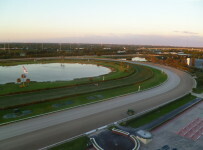 HorseracingFLA estimates that attendance was in the17,0000 range on Saturday. 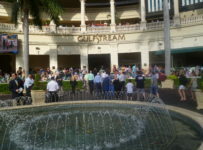 As usual on big days at Gulfstream, most fans took the situation in stride as they dealt with long lines for betting and refreshments. There did not appear to be a large number of instances when fans were shut out from betting. 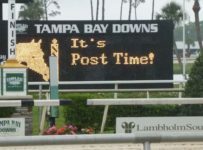 Gulfstream often prevents that problem by delaying the post times for several minutes before the start of the Pick 4, Pick 5 and Pick 6 to help build the pools for those bets. 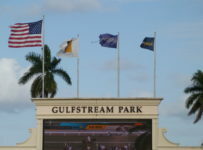 Gulfstream held the Breeders’ Cup in facility with the 25,000-seat grandstand building that it tore down following its 2004 race meet. The building it opened in 2006 has about 1,000 seats facing the track and viewing space for about 500 in restaurants and luxury suites. 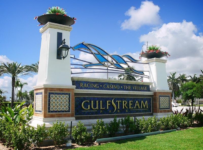 In 2012, Gulfstream said it was planning a redevelopment and expansion that would give it as many as 50,000 permanent seats–with goals that include being eligible for future Breeders’ Cups. But Gulfstream has not announced any plans for starting an expansion of its plant. Instead, it is focusing on growing the handle and on other racing issues–now ten months each year at its track and two months (October and November) when it holds a meet at Calder Casino & Race Course.